There are two things I discovered while writing this post. 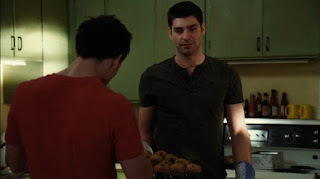 Firstly, that I really need to re-watch Rookie Blue from the beginning through the season six finale. It’s been entirely too long since I have. And secondly, that it is very, very hard to narrow down seventy-four episodes to the top ten. That’s when I made some ruthless decisions… and just barely cut my list down to the necessary ten. These are some of the episodes I felt were pivotal, funny, or just simply well-done. They are the ones that stand out in my mind when I think of pure examples of Rookie Blue's greatness. However, there are still 64 other episodes out there that I loved to pieces. So, join me in a – chronological – look down memory lane. If I almost caved in and renamed this post "Hope’s Top 15 Episodes" (one slippery slope away from "Hope’s Top 74 Episodes"), I certainly couldn’t bring myself to pick favorites out of my favorites. Therefore, numbers don’t equal any sort of ranking. And to keep from these turning into full-blown reviews, I’ll just highlight, in paragraph or so, why they made the cut. Spoilers ahead for the episodes discussed and possibly for others. I couldn’t make a list of my favorite episodes without including this one, where it all began. I think I can honestly say that Rookie Blue was the first series I’d ever watched from the first day it premiered. I saw the promos, I watched the pilot… and now we’re here. In this episode, everyone is so brand new and clueless, and it’s adorable. McNally takes down and arrests an undercover Sam, then gets in trouble for it, as if she was supposed to know he was a cop. It’s the first of many moral dilemmas this show confronts. She follows her hunch and her desire to do things right, and talks down a kid with a gun (now The 100's Devon Bostick) in a truly emotional scene. There’s something I just really loved about this episode. Maybe it was the woods. I think it had a lot to do with the woods. Andy and Sam had to do a prison transfer, and in the world of television, those NEVER end well. The prisoner escaped into the woods and a rather angry Andy and Sam had to search for him. This resulted in a hilarious ("No, they fell off a beaver!") and intense sequence of events. I haven’t watched this episode in a while, but I’m pretty sure nothing huge or game-changing happened. Nonetheless, it sticks out in my mind as one of my favorite episodes of season one, and reminds me of why I started loving this show. "Get off the car, rookies!" This episode ended on the bittersweet note that, technically, the rookies weren’t rookies anymore. They were officially cops. Sure, they had a ton of mistakes and lessons ahead of them, but the end of season one was a huge milestone. Besides that, this episode was intense. Gail and Chris (who was seriously injured) were trapped in a warehouse, and Andy and Sam had to go on an undercover operation. This was the start of Rookie Blue's yearly two-part high-stakes finales. And I love those. I think most dramas have those episodes. There are typically a few in a series – they’re the ones that deliver a sucker-punch. They’re also the episodes that are probably secretly sponsored by Kleenex. This was one of those episodes. They directed our focus to Gail, who had been kidnapped by a serial killer. THEN, in a huge twist, Jerry is stabbed while trying to save her. The impact of his death would extend into the rest of the season (and let’s face it, reverberate for much longer), and it was clear that after this episode, nothing would be the same. This episode gets extra points for the storytelling method used. Everyone remembers the events of that day – including homemade muffins courtesy of Chris, and Andy hiding Nick in a conference room ("You made muffins? How long was I asleep?") – giving us a really cool perspective on the episode. There’s also the intensity of having SIU interrogate everyone (it also reminds me of an episode of Flashpoint called "Acceptable Risk," and any show gets points for that). The climax in the holding cell was intense and heartbreaking, as the subject whom Chris was trying to talk down was shot. However, the necessary levity in this episode was abundant. What more can one ask out of an episode? I said I wasn’t going to pick favorites out of my favorites, but let’s just say this is one of my favorite favorites. 5. "You Can See the Stars"
Kevin Ford (played brilliantly by Michael Cram, also known as Flashpoint’s Wordy) returned and attacked 15 Division. It made for an intense end to the season. Chloe was shot and struggling to survive in a hospital room. Oliver was kidnapped. This episode was non-stop drama. Ford made it into the precinct, where he started shooting, aiming for Nick but hitting Sam instead. This was another classic example of an all-out, action-packed Rookie Blue season finale. While Sam and Chloe are in the hospital, Andy and Dov run out to a little diner to grab something to eat and move around a little. Then all heck breaks loose as a couple of kids decide to hold up the place. There’s something I love about procedurals taking their format and flipping them around for an episode. Instead of a case happening and the characters going toward it, a case happened to them. There was already so much drama going on to begin with, and to double the suspense by adding the hostage situation was a smart move on the show’s part. It came back from its ten month-long hiatus and made a huge impact when it did. 3. "All By Her Selfie"
Also known as: the arrival of Duncan. Remember how he insensitive he was? How he picked up a golf club at a crime scene – without any gloves on? How he tried to make things right and only made them a hundred times worse? How he wanted to take pictures? And how, in the middle of a crisis, Andy pulled out some gum and offered a piece to the guy pointing a weapon at them, partaking in what should be called the Oliver Shaw Training Method? I picked this episode over a couple of others because we see Andy come full circle here. When Oliver gets promoted to Staff Sergeant, she becomes a training officer. She was so enthusiastic about training a "super cop," but as a rookie T.O., she had her own share of learning to do. It was hard, but I chose this episode over its second half, "Everlasting," because of the intense scene in which Duncan – still naïve but with good intentions – having taken matters into his own hands, manages to get himself knocked unconscious and locked in a car that’s rigged to blow up. As the clock ticks down to the wire, Nick does his best to disable the bomb and manages to cut it far too close for comfort. Duncan obviously made a mistake, but he does earn more respect in this episode. A lot of things culminated as well – from Dov and Chloe’s breakup, to Gail’s decision to adopt, to Andy and Nick’s serious talk – which set the season up perfectly for the finale. What can I say that I haven’t already said about this one? This was a beautiful episode all around, from the writing, to the acting, to the directing… just everything. It was the culmination of everything that has happened in the series so far, and it was the open window for where this series – and these characters we’ve been on this journey with – can go.